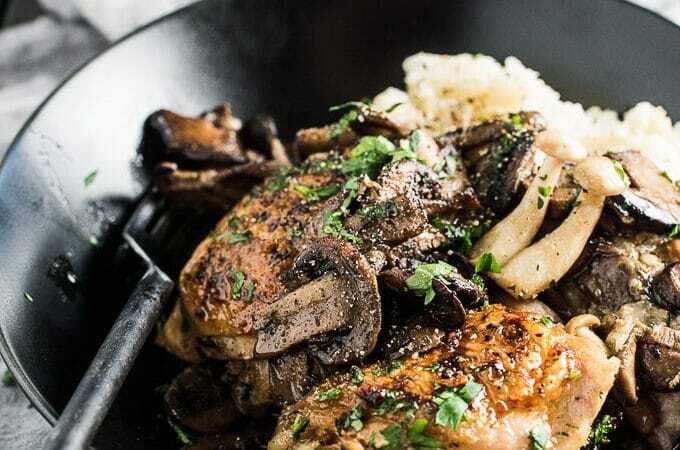 This crispy skinned, Pan Fried Chicken and Mushrooms is the ultimate feel-good comfort food. The chicken is seared in a skillet with loads of mushrooms then served over an easy to make cauliflower mash. It's a healthy dinner recipe that is so delicious. It's also naturally paleo + low carb + Whole30 compliant. I know that summer is calling our names and coaxing us outside to our grills, but sometimes you just need a good pan fried chicken recipe. I'm talking about salty, crispy skin, juicy chicken, and mountains of mushrooms all served over creamy mashed … cauliflower. Whoa, hold on there, my friend. Please don't run away yet! Cauliflower is at it again, making itself out to be something it's not. It's not going to fool you completely this time, but it's a damn good impersonator. I'll take the slight cauliflower taste for all the low carb/ high nutrition it offers. If the idea of pretending cauliflower potatoes is too much for you to handle, go ahead and make this pan fried chicken with regular ol' mashed potatoes. No harm there! This recipe, which turned out to be more of a no recipe, throw everything in a pan and cook it dinner, was a staple during my Whole30 Adventure. It's a healthy dinner recipe that doesn't leave you feeling like you're missing out. Full on meat and potatoes (err … cauliflower) here. I think that's what I loved most about doing The Whole30 Program. I never felt like I was missing out because all of the food I ate was the back to the basics recipes I grew up with. Almost all of my dinners were based on the old principle of meat, veggies, and a carb. It's the way my mom used to cook for us when we were kids. There would always be a protein, one carb (usually potatoes or rice) and two veggies (usually carrots and often peas). Pan fried chicken + mushrooms + mash + a big side salad = dinner! See those cute little mushrooms in the picture? Are they not the best ever? They're called Shimeji mushrooms and I think they are ADORABLE! And yes, I just called mushrooms adorable. They're sold in small, clamshell packages like the ones you buy alfalfa sprouts in. They come with their roots intact so before you cook them you cut them from their roots. I like to keep some of them in pairs so they look like little forest mushrooms. ← Back to that adorable thing again. I live on the edge of Chinatown so finding them in my neighborhood is never an issue. They're almost as common as button mushrooms in the stores I shop in. If they're not available near you, don't sweat it. Use whatever mushrooms your store sells. I've also listed shiitake mushrooms in the recipe. Fat Asian shiitakes are much cheaper than their smaller counterparts typically found in western grocery stores. I personally wouldn't splurge on expensive shiitakes for this simple recipe. Just sayin'! If you make this Pan Fried Chicken and Mushrooms make sure you snap a pic and tag #theendlessmeal on Instagram so I can like and comment on your photos. I love seeing TEM recipes you create! 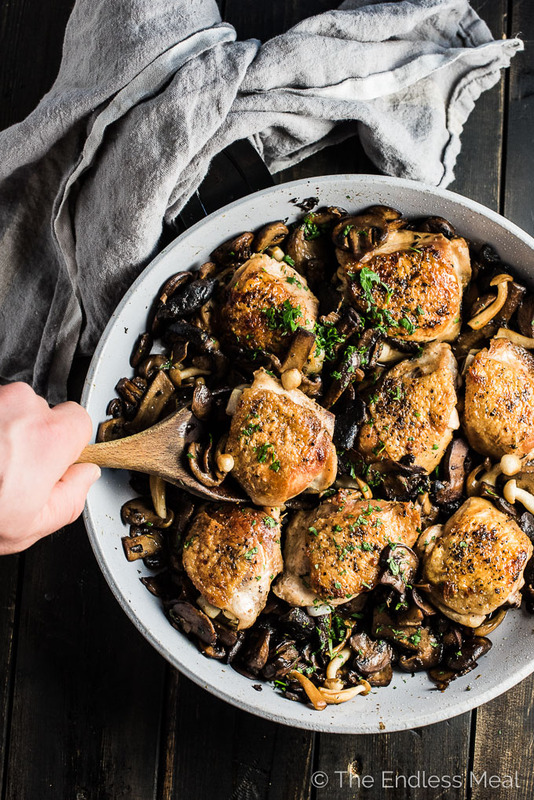 This crispy skinned, Pan Fried Chicken and Mushrooms is the ultimate feel-good comfort food. 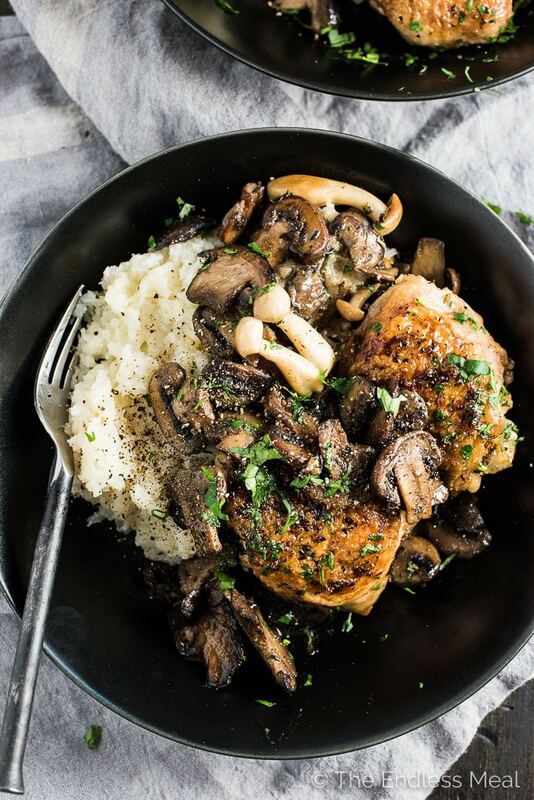 The chicken is seared in a skillet with loads of mushrooms then served over an easy to make cauliflower mash. It's a healthy dinner recipe that is so delicious. It's also naturally dairy free + paleo + low carb + Whole30 compliant. Place the cauliflower, garlic, and 1 cup of water in a medium-sized pot and bring to a boil. Reduce the heat to medium, cover, and cook for 15 minutes, or until the cauliflower is very tender. If there is any water left in the pot, remove the lid and keep it on the heat for a few minutes until it evaporates. Add the ghee and sea salt and mash until smooth. While the cauliflower is cooking, prepare the chicken. Heat the oil in a large, non-stick frying pan over medium-high heat. Place the chicken in the pan, skin-side up, and sprinkle the chicken with salt and pepper. Cook for 10 minutes, or until the chicken shrinks a little and the bottom is brown. Flip the chicken so it is skin side down and cook until the skin is crispy and the chicken is cooked through, about 10 more minutes. Remove the chicken from the pan. Add the mushroom to the pan increase the heat to high. They will release a lot of liquid when they begin to cook. After about 10 minutes, once most of the liquid has disappeared from the pan, reduce the heat to medium-high and cook until the mushrooms have browned, about 5-10 minutes more. Add the chicken stock, thyme leaves, salt, and pepper to the pan and bring it to a boil. Scrape any brown bits off the bottom of the pan. Add the chicken back to the pan, skin side up, and quickly reheat. 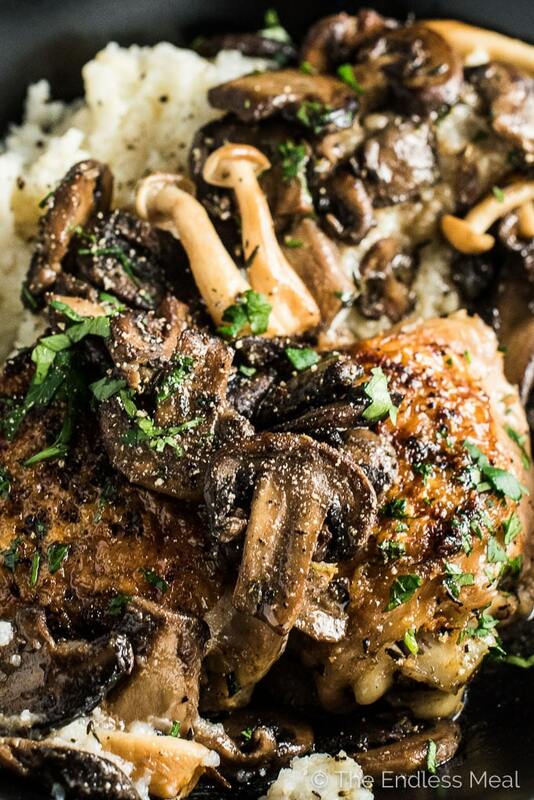 Serve the pan fried chicken and mushrooms over the mashed cauliflower and sprinkle with a little parsley. Great minds think alike, sista! !